One of our vacation budget stretchers is to save up spending money all year long. Believe it or not, we actually use a piggy bank and add to it whenever we can. When we find a coin on the ground, we get a bit giddy! While loose change does add up pretty fast, about $100 per year, that doesn’t make for much vacation fun. That’s where Groupon Coupons comes in! 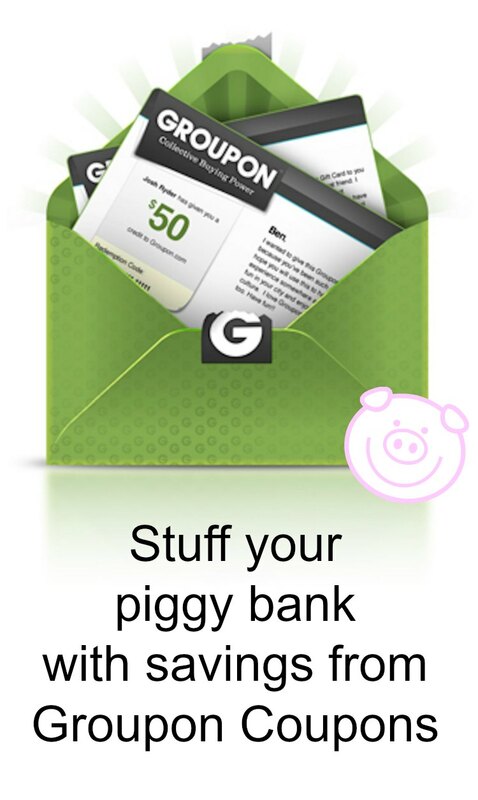 When I’m out shopping — or shopping online — I take a minute to check in on Groupon Coupons to find bonus savings. Then I shop as usual. Once I get home (or finish shopping online), I add whatever I saved with my coupon to the piggy bank. To grow our savings even faster, I round up to the nearest dollar. Besides, it’s a lot easier to count dollar bills than pennies, nickels and dimes! 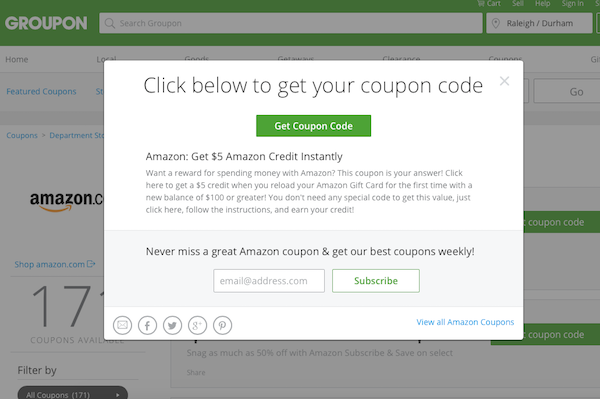 Hover over the “Coupons” tab to find a list of retailers. Click on the store where you want to shop to find available coupons. If shopping online, activate coupon and finish shopping. If shopping in-store, open the in-store coupon and present it at checkout. Easy! When you’re done, add the savings to your piggy bank and grow that vacation fund. This summer, we’re planning to spend a lot of time at our favorite lake. After a morning of kayaking and paddle boarding, a little relaxation is in order. So, for Father’s Day, I’m getting my husband a sturdy raft to enjoy on the water. SHHH!!! He’s banned from my site until Father’s Day. If you know him, don’t tell! Here’s how it worked, step by step. On the coupons page, choose the best deal and click that coupon code. For me, adding money to a gift card offered the best deal on this particular purchase. Follow the prompt to get the Groupon coupon code. Before that final click, double check that your coupon was applied. I got a bonus $5 when I reloaded my gift card, and I checked to make sure the money was there. One Father’s Day gift is in the bag (or in the box) — and I saved a bit too. Since this post is sponsored by Groupon Coupons, I had to pause my purchase because I didn’t want my husband to see the screenshots as I ordered. That would ruin the surprise! When I went back today, the price dropped. YAY! So, I’ll be adding the $5 from the coupon plus the $3.68 in price change to our vacation piggy bank. Not too shabby — especially since I was shopping anyway! Do you use Groupon Coupons? If you have a tip to save, please share.